On my recent trip to Louisville, I went into the Four Roses gift shop with a purpose--to find a gift shop exclusive private selection, one I hadn't had before. 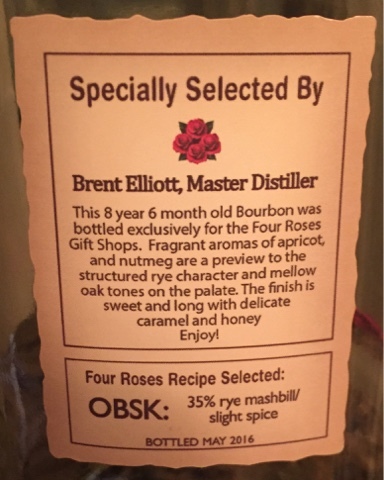 The gift shop only had three offerings, but luckily for me, one of those was an OBSK, a recipe I hadn't had before, selected by Brent Elliot, Four Roses' master distiller, exclusively for the gift shop. Once back on the bus, I didn't hesitate to ask for a cup so I could immediately pour this and try it out. I was not disappointed! On the nose I was hit with a strong vanilla scent, which was accented by a distinct maltiness as well as the tell-tale spiciness of a high-rye bourbon. The flavor did not have any of that malt flavor, though. The first few drinks were prominently cherry and cinnamon, with the traditional vanilla flavor coming behind it. A peppery spice made its way through on the back end as well, offering a great blend of sweet up front and spicy at the back end. Interestingly, I found that over the next few weeks, this bottle significantly changed and was a very different bourbon at the end. The cherry flavor seemed to disappear, and in its place was almond mixing with chocolate and vanilla, which sounds like it would come across as incredibly sweet, but that was not the case here. Rather, these flavors were complemented by a smokiness, stronger than I've ever noticed in a bourbon before, and reminiscent of a peated Scotch. And yet, that malt from the nose never seemed to make its appearance. I really enjoyed the smokey vanilla flavor with the almond undertones as I finished off my last few pours of this, and it was one of those bottles where I was a little sad when it was over. Though it seemed to almost be two different bourbons from the beginning to the end of the bottle, it was nonetheless fantastic throughout. 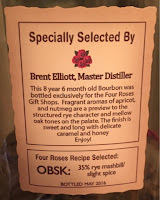 This one was younger than most of the private bottlings, but Mr. Elliot did a great job in selecting a fantastic barrel for this particular bottling, and I could not be happier to have had the chance to grab it while I was at Four Roses.